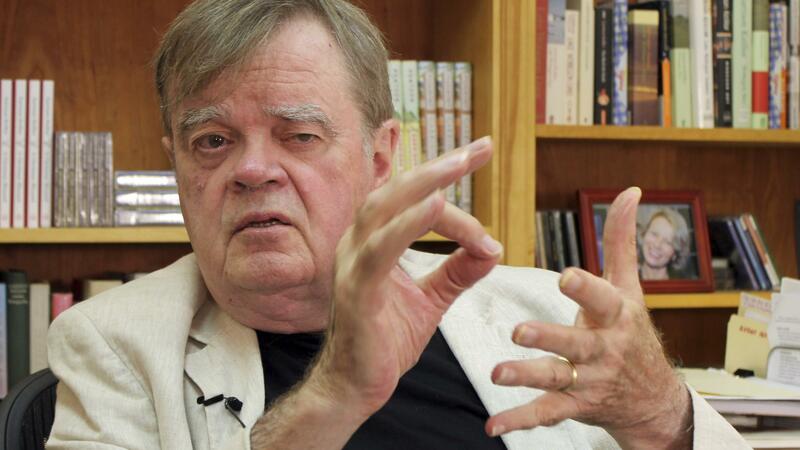 Garrison Keillor, creator and former host of A Prairie Home Companion, talks at his St. Paul, Minn., office in July. Minnesota Public Radio has announced it is cutting ties with Keillor and his production company owing to allegations of inappropriate behavior. Garrison Keillor, the creator and former host of A Prairie Home Companion, has been accused of inappropriate behavior with someone who worked with him, according to Minnesota Public Radio, which has announced it is cutting ties with Keillor and his production company. In a statement released Wednesday, the NPR member station says it learned of the allegations in October and has retained an outside law firm to investigate them. That investigation is ongoing. In statements to the Minnesota Star Tribune, Keillor said that he "put [his] hand on a woman's bare back" and alleged that he had been groped by dozens of female fans. Keillor, 75, no longer hosts A Prairie Home Companion, the show indelibly tied to his name. But he continues to produce The Writer's Almanac. Both shows are widely carried by public radio stations across the country. MPR says in its statement that the station and its owner, American Public Media, will no longer distribute Writer's Almanac and will stop rebroadcasting The Best Of A Prairie Home Companion. In addition, new episodes of A Prairie Home Companion — now hosted by Chris Thile — will be given a new name. The allegations "relate to Mr. Keillor's conduct while he was responsible for the production of A Prairie Home Companion," MPR says. "Based on what we currently know, there are no similar allegations involving other staff." "Garrison Keillor has been an important part of the growth and success of MPR, and all of us in the MPR community are saddened by these circumstances," Jon McTaggart, the president of MPR, said in that statement. "While we appreciate the contributions Garrison has made to MPR and to all of public radio, we believe this decision is the right thing to do and is necessary to continue to earn the trust of our audiences, employees and supporters of our public service." Keillor told The Associated Press that MPR cut ties with him over "a story that I think is more interesting and more complicated than the version MPR heard." The radio personality later told the Star Tribune that he was not, in general, physically demonstrative, and that the incident that led to his firing involved touching a woman's bare skin. "I meant to pat her back after she told me about her unhappiness and her shirt was open and my hand went up it about six inches," he said. "She recoiled. I apologized." "If I had a dollar for every woman who asked to take a selfie with me and who slipped an arm around me and let it drift down below the beltline, I'd have at least a hundred dollars. So this is poetic irony of a high order," Keillor later said. On Tuesday, The Washington Post published an opinion column by Keillor in which he defended Sen. Al Franken, accused of forcibly kissing a radio host and groping another woman during a photo, against calls for his resignation. "On the flight home, in a spirit of low comedy, Al ogled Miss [Leeann] Tweeden and pretended to grab her and a picture was taken. Eleven years later, a talk show host in LA, she goes public, and there is talk of resignation. This is pure absurdity, and the atrocity it leads to is a code of public deadliness," Keillor wrote. "No kidding." Keillor, who was never part of MPR's newsroom, openly supports Minnesota's Democratic-Farmer-Labor Party and has personally donated thousands of dollars to Franken's campaigns, according to FEC data. But his column on Franken was not the first time Keillor has pushed back against criticism of sexual harassment. Howard Mortman, the communications director of C-SPAN, notes that in 1994 Keillor spoke at the National Press Club in D.C. and said, among other things, " A world in which there is no sexual harassment at all is a world in which there will not be any flirtation." The crowd was quiet. "A world without thieves at all will not have entrepreneurs," Keillor said next, and at that, the crowd laughed. Allegations of misconduct — specifically, of sexual harassment — have caused a number of prominent men to lose their jobs in recent weeks, including two top editors at NPR. Earlier Wednesday, NBC News announced that longtime Today host Matt Lauer had been fired over a complaint about "inappropriate sexual behavior in the workplace."